Needless to say, setup would be critical for this. 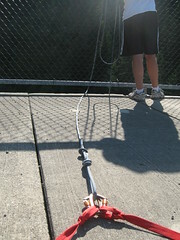 After a thorough survey of the bridge, we determined that the best points to tie into would be supports for the railing. It was a thick steel plate with little or no corrosion secured by several large bolts. Stress testing (i.e. yanking on it) indicated that was securely fastened to the bridge. With that, Peter began the actual setup. We’d have two lengths of webbing (red) attached to the two anchor points (the railing supports) tied using a water knot. The opposite ends would also be tied in a water knot with two opposite and opposing locking carabiners. The 60 meter rope would be attached to the carabiners with a figure eight loop and the strung across the walkway and over the side. In retrospect, I’m not sure this was the best idea. The structure should have been designed to to support a horizontal load applied to it, but the way the steel was bolted makes me think that applying the load horizontally instead of vertically would increase the shear stress. It probably doesn’t matter that much since the entire railing was over designed (any thoughts on this Peter?). Satisfied that the system was relatively redundant, we had a quick safety conversation (which pretty much involved me asking how to tie off midway down if I needed to and Ben asking what he should do should one of the points failed). Peter put his pack on and clipped in.